The recently announced Singapore Savings Bonds (SSB) has the potential to be a game changer for savers in Singapore. Details on how to buy them are not available yet but they are expected to be launched in the 2nd half of 2015, with a fresh issue every month. It’s an interesting product with a hybrid of features that has more pros than cons. Principal guaranteed by the government. Flexible redemption – You can redeem any time without penalty at cost. Unlike conventional bonds, investors are not subject to the risk of a capital loss in a rising interest rate environment should they sell before maturity. Term of up to ten years but you do not need to decide the duration upfront because of the step-up interest feature. 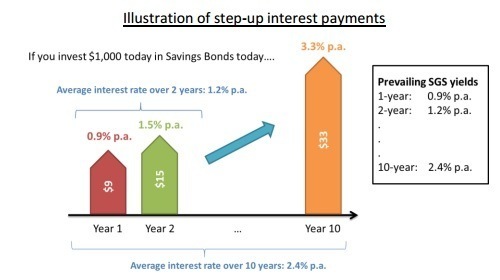 Step-up interest – Interest increase over time depending on how long you hold it. Small minimum amount of $500 with subsequent multiples of $500. No costs or commissions to pay. There is a limit to how much you can buy. This amount has not been announced yet. Interest rates might not be fantastically high compared to some other instruments. The interest rates for each particular issuance are locked in at issuance. This will be a disadvantage in a rising interest rate environment. You cannot compound the interest payments. The key thing that determines how useful this product will be is the interest rate that it pays. It has been announced that it will be linked to Singapore Government Securities (SGS) rates. Unlike SGS that pay the same coupon each year, Savings Bonds will pay coupons that “step-up” or increase over time. 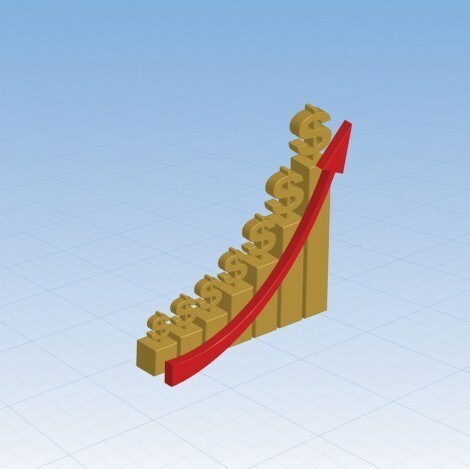 As a result, the average interest rate is higher the longer the Savings Bonds are held. These coupons will be paid every six months. For example, take the case (close to current rates) where 1-year SGS is yielding 0.9% p.a., 2-year SGS is yielding 1.2% p.a and a 10-year SGS is yielding 2.4% p.a. In the first year, you will earn interest based on the 1-year SGS yield at the point you bought the bond (0.9% p.a.). In the second year, you will earn an interest (1.5% p.a.) higher than the 2-year SGS yield (1.2% p.a. ), so that on average over the two years you would have received the 2- year SGS yield. In the tenth year, the Savings Bond will pay an interest of 3.3% p.a.. The total return or average interest on your investment (2.4% p.a.) will match what you would have received had you bought a 10-year SGS at the time of your investment. To me, this step-up feature is a free lunch (along with the redeem anytime at cost) and sounds too good to be true. For people who leave their extra money in standard bank savings accounts, it would be a no-brainer to buy the Singapore Savings Bond for the extra yield. However, for people with a short term horizon of a few years, a rolling fixed deposit might actually outperform the SSB. If you intend to hold the SSB for ten years (earning less than 2.5% p.a. at current rates), then its performance compared to a conventional fixed deposit will depend on how interest rates move over the next decade. If interest rates go on an uptrend, you might actually earn less from buying the SSB compared to renewing your fixed deposit every year. One way to mitigate this risk is to not to commit everything at one go to buy the SSB but instead buy a fresh tranche of SSB every year (holding each tranche for ten years). If the SSB turns out to be very popular, the banks might very well be forced to increase their own interest rates to compete. If this happens, it would benefit everyone, even those people who do not buy the SSB. SSBs appear not to have duration or interest rate risk. If rates go up, I can simply sell my existing SSBs without any penalty, and buy new SSBs with higher rates. This is unlike for normal bonds and SGS. – historically low interest rates of SGS which is lower than real-life inflation. Hence SSBs is useful as parking space for your money where currently you put into FDs, savings deposits, money market funds, short-term endowments. You are correct. However, if you sell your existing bond in the early years, you would have earned very little interest in the first few years. So, the rollover is not exactly a perfect one. There will need to be some calculation on whether it is worthwhile to roll-over.